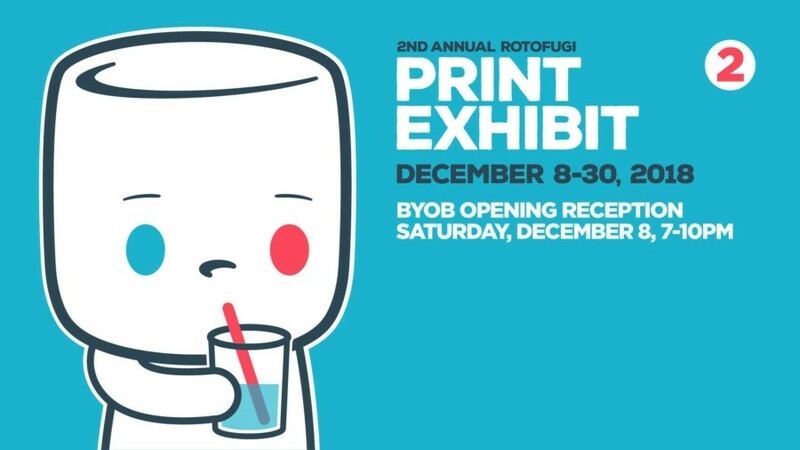 December is creeping up on us and cold weather is starting to set in (at least here in Chicago) so it’s almost time for our new holiday tradition…the Second Annual Rotofugi December Print Exhibit! This year we decided against having a theme, instead recruiting some of our favorite artists (plus a few fresh faces) and turning them loose to create. Whether you’re looking for some new inexpensive art, or perhaps looking for the perfect holiday gift for the art lover in your life, we hope this new December tradition brings you something to enjoy! Participating artists include 64 Colors, Blake Jones, CHema Skandal!, Cherry Moth Cake, Chinacat663, Cindy Scaife, Curtis Readel, Dan Grzeca, Hebru Brantley, Jay Ryan, Joey D, Keith Herzik, Mark ‘Atomos’ Pilon, Mike Bell, Shawn ‘Shawnimal’ Smith, Steve Seeley, Tony Rabit, Veggiesomething, Vivian Le, Zach Schrey & Zissou Tassef-Elenkoff. Join us for the opening reception on Saturday, December 8, 7-10pm to check out and purchase prints, and enjoy music by DJ Sean Doe plus complimentary snacks and soft drinks (BYOB if you want to have alcohol). For BYOB, we are steps away from Beermiscuous, one of Chicago’s best craft beer shops — 350 cold beers and ciders (over 200 local beers!) are available in a singles format, allowing you to create your own mix-and-match variety pack for the event! Exhibit continues through December 30, 2018. Sales/Preview Note: There will not be an online preview for this exhibit, and in-store sales will start promptly at 7pm on December 8th. No pre-sales. Prints will be made available on our website in the week following the opening — sign up for our Gallery Previews email list at http://previews.rotofugi.com to receive notice when online sales are available. Thank you!